Now this one leaves me with more questions than answers. 1 – There’s a place called Bacon Camp? All those years I was going to sleepaway tennis camp when I could have been learning how to make a BACON WEAVE? Brian Boitano, the figure skater, made a thing called the bacone on The Food Network? 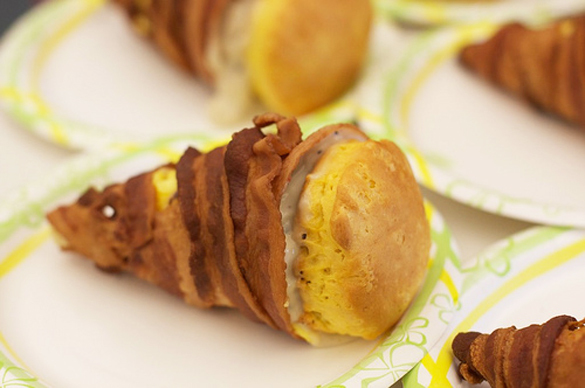 “A luscious cone of curled bacon, filled with a delicious mix of scrambled eggs, cheese, and hash browns, topped with proper country gravy and a warm biscuit.” Brian Boitano, hungover college students everywhere should be thanking you. Here’s the recipe (it clocks in at a surprisingly low 500 calories) – my favorite step: “liberating the bacone.” And if your cardiologist asks where you got this, you and I never had this talk. September 3rd is International Bacon Day. Go big or go home, folks. You should make that at our house! I will do no such thing! Your children will be making me cookie skillets three meals a day.